Dame Janet Baker gives magical performances of a generous collection of 28 songs, representing Fauré throughout his long composing career, including many of his most winning songs. Geoffrey Parsons is at his most compellingly sympathetic, matching every mood. 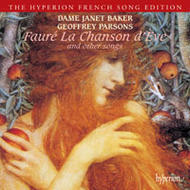 Many will be surprised at Fauré’s variety of expression over this extended span of songs.